Beck played a short acoustic set at a tribute concert for Jac Zinder. The "One Foot" has the usual harmonica, but with an entirely different ad-libbed lyric, Beck just making up some story about a jogger in dolphin shorts. Jac Zinder: L.A.'s underground music scene lost a major catalyst last week when promoter, deejay and critic Jac Zinder died in an automobile accident on Thanksgiving. 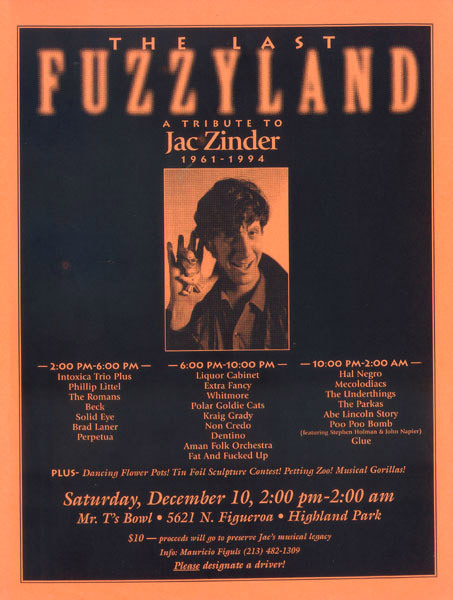 Zinder, whose Fuzzyland was one of the city's coolest and most eccentric clubs, had been supporting obscure and offbeat bands since his days as a sound man at the Anticlub in the early '80s. Following his full devotion to the weird, he went on to set up his own shows and tiny clubs (including Third Eye) wherever there was space, supporting such bands as L7, Beck and Extra Fancy along the way. As a deejay he was able to spin everything from lounge tunes to Middle Eastern mantras and make them danceable. Zinder, 33, also wrote for the L.A. Weekly seemingly about every form of music around. "(Jac's) tireless work at making a cool underground will be missed," said L7's Donita Sparks and Suzi Gardner in a faxed statement. "We can't count the number of times we'd see him around town passing out flyers for some truly bizarre show or club he'd concocted. He was a master patron of the obscure and absurd. We'll miss him."